Charlotte is Moved: Summertime is Itchy Time. We are now in the depths of Australia’s summer. January and February have been, for as long as I can recall, pretty unbearable wherever I found myself. In Sydney and northward the humidity rises, further south the hot winds blow, and on the other side of the continent there seems to be a mixture of both. They call it Mediterranean there, the climate, but that may be a euphemism. And things are slated to get worse. The global temperature for 2014 has already been designated the hottest on record. It’s hard to imagine it getting any hotter down here, and that may be why so many of our politicians are loath to countenance human-induced global warming, though it’s getting harder for anyone to seriously deny it. Yet in one respect things are undoubtedly better. It will be 57 years this October since I first stepped onto an Australian shore and encountered in very short time its annual plague of insects. The good old Aussie salute is now a thing of the past - you rarely see anyone waving their hand in front of their face in a vain attempt to brush away the flies. The flies have almost entirely disappeared, so much so that the practice of outdoor eating is celebrated rather than scorned and it’s even possible to contemplate a picnic. We still have our brushes with the insect world but they tend to be without pain and rarely require much in the way of stoicism. A friend of mine recently took a trip to Tasmania and got a hell of a bite from a bull ant. It stung her badly but the shock of it may have overtaken the actual physical sensation. Bull ant bites were common when my kids were young, but this is the first I’ve heard of one for years. Then there are our spiders. The male funnel web can still kill an adult but an antivenom was developed in the early 1980s, and no death has occurred since. Similarly with the redback; there haven’t been any fatalities from it since 1956, when an antivenom for that came on the scene. Other spiders, particularly daddy longlegs and the huntsman, are relatively harmless, and as the huntsman is said to trap flies, it's never bothered me much. The flies have been brought under control by various species of dung beetle introduced over the 70s and 80s. Until then flies were the curse of the Australian countryside and domestic life. One of my strongest memories of the 1960s is looking up from the breakfast nook in my Sydney kitchen to see that the entire ceiling was black from end to end with houseflies. No exaggeration, this. I dispersed them with such copious spurts of Mortein spray that it wiped out all the flies but caused me to break out in a serious case of hives. Cooking in Canberra, ‘the bush capital’, brought hundreds of blowflies beating against the flyscreens. Incidents such as these, though commonplace once, are buried in Australia’s near past. It would have been quixotic in the extreme to launch any kind of tourist industry if they were allowed to persist. And whatever happened to the Christmas beetles? You see a rare specimen now but nothing like the swarms of them that soared through open windows from November to December and made bedtime reading all but impossible. There was nothing quite as gross as the way they clung to your skin once they’d landed there. Newcomer that I was, for me they seemed the very last straw. One night a friendly neighbour offered to sit with our two sleeping babies so my husband and I could go out. I don’t remember the occasion and I don’t have the same husband, but that is by the by. Our neighbour spent the time on the telephone in our bedroom and as the beetles flew in he deposited them under the sheet on our bed. We crawled into it after the night’s partying only to find the mattress curiously alive. The sheet was flung back, and there they were in their hundreds, covering the entire expanse of our double bed. The neighbour was still a neighbour after this, though no longer a friend. Australia has no monopoly on creeping, crawling, bitey things, but for a while it seemed the only country prepared to put up with them. The California where I hailed from had chiggers, trombicula, I’ve learned through writing this piece, and these weren’t mosquitoes, Hummer-sized as I’d thought, but mites of the arachnid family. I remember them as associated with summer camps. We had mosquitoes, too, but our windows were routinely screened, which Australian windows were not at the time, or not very often. And I was armed in other ways, most particularly by the spirited poem ‘Man Bites Dog-Days’* by the one and only Ogden Nash, which at least offered laughter as a remedy. Its dolorous refrain has stayed with me as other more worthy prosodies have not. Things have improved, as said, but not entirely. What we may be experiencing is no more than a temporary stalemate, destined to be broken when conditions prove right. We live in an old building, close to a hundred years old – something of a rarity in these parts – whose heritage windows don’t allow for flyscreens, so we’ve been advised to get a zapper instead, even though they’re reported not to do much for mosquitoes. Not only that, but the building has had a cockroach problem for years. I’d been using the little black plastic baits with considerable success but this summer for reasons as yet unestablished they can’t be bought for love or money, and the population has exploded. A battle royal has begun to keep the numbers down and, most importantly, to keep the buggers out of foodstuffs and away from china and cutlery, while avoiding poisoning ourselves with spray. It’s not a battle I feel confident about winning, based on progress so far. 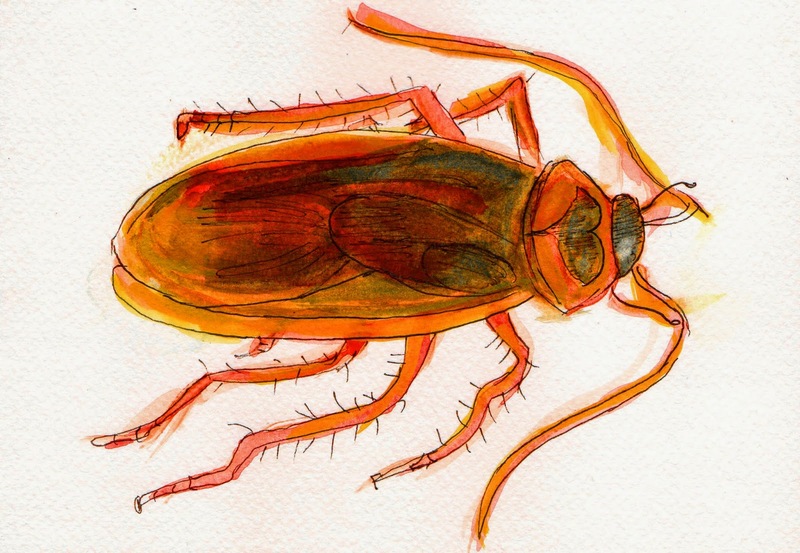 Cockroaches have been around for some hundreds of millions of years and look like lasting longer than we will. So too, maybe, with millions of other insects. For notwithstanding our successes, it wouldn’t take much to tip the balance. Whatever the relation between accelerated global warming and the war between human beings and insects, I’ll put my money on the latter. They’re older, cleverer and, on the basis of much of our behaviour to date, I reckon they deserve to survive. It’s aftermath of itching yields. Someone murmured, Do not scratch it. Raise on people bumps and ridges. Summer time is itchy time. Nor is the peach by sunburn tortured. Prickly heat prowls forth to feed.